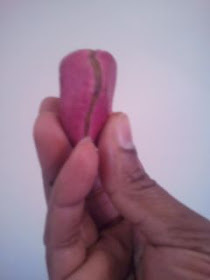 From Oxondu Okoye, Nigeria. Nov 24, 2011. Ekwuonam this thing before. O'di nnukwu mwute that na we Igbos anaghi e'pay attention to our language. Let me tell you nke bu eziokwu, a people na anaghi adi proud of their language nwere nnukwu nsogbu. O'di difficult ndiahu i'survive as a people. It is not a joking matter, m'obu ihe eji egwuri egwu. The situation a dila critical, nke na, etu osiri wee di ugbua, ufodu na ele anya na in 40 years mobu 50 years na bia n'ihu, that, a ga akwusi isu Igbo kpam-kpam. God forbid! Tuffiakwa! Owee buru ya, Umuigbo, yabu ichi eruola n'odu anya. A ga emenu ihe nkaa gini-nee!? I chekie the situation ofuma, i ga ahu na o'di critical. Kedu nke bu na otutu nime anyi ga ano ndu, ma our great language bu Igbo-Gbajiri-Igwe, oburu na o'disappearla n'efu? Onye ka ana koro that rubbish? O bu my humble contention that na, first of all, onye obula ga ewere ire ya guba eze ya onu. Nkaa suppose-iri i bido taata, not tomorrow. This night, onye nabaa ura, ya juo onweya one question: Kedu ihe make-iri ya difficult gi bu nw'afo Igbo isu your language? Elee ih'oo? What is actually the problem? O'bu ihere na aga asi na imaghi akwukwo? O'bu na Igbo adighi uto na nti? Ka o'bu na aga asi n'ibu a pagan? K'obu na Igbo ezughi ihe ichoro ikwu? Achoghi'm anybody i'projecti the problem to another person, or ikowa theories. Ihe'm choro bu, juo gi'onwegi the question. Searchia your mind thoroughly, and oburu na ichoputa an answer as pertains to you, i'share-ya with us. From the research emegoro, enwere quite a few explanations. Mana, the most important factor bu: Anyinwa n'onweanyi. English a burula anyi status symbol. The way and manner anyi si wee a'pursue Western education and values abughi for any purpose na abughi ka our status wee rise'a. It was all about status. Therefore, ndi di educated na ahu isu Igbo as a negative trait, ya bu, ihe ana achodighi acho at all. Ndi ozo na adighi educated na strive ka ha meetie up, by i'neglecti Igbo, and na a'try'i ka ha na akusa English anyhow. In Igbo land, oburugodu Eze na achi obodo, nke o'bu ya di responsible for culture na omenala, ikpaya aka n'onu, ihe ga aputa there bu: One Igbo word, 10 English words. Anaghi ekwuzi maka ndi Dr., Master's, Bachelor's, Chief enu na Chief ala - otu ije ahu! Ndia bu ndi o'supposiri na Igbo ga eji their light wee na aga. Owee buru na ndia a'passitaghi anything. What a pity! Kedunu ka anyi ga esi wee reverse-ia this shameful and dangerous trend? 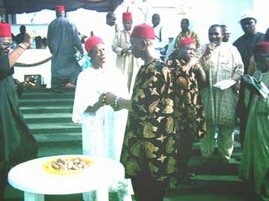 Eji'm ohere'a wee na call on all sons and daughters of Igbo, na all Igbo forums, ka ha tinye okwu'a onu. O'ga aba uru m'oburu na your contribution adi personal, that is, etu osi metu gi n'obi. Anyi achoghi to intellectualise the matter. Let us confess to our brethren, mee nkwuputa ga abara anyi uru. Another thing: ihe'a ana akpo "Ingiligbo", personally, kedu plan etu inwerike wee reduce-ie the intensity? To be honest, onwe ka the thing si a'soundi stupid na nti in real life; in fact, onwere ebe a na suruo that Ingiligbo, odizie ka onyeahu obu onye iberibe. And o'o ihe obu. However, o'matter'ghi ma izara ajuju'a na Ingiligbo, ma izara ya n'Igbo kara-aka, ma obukwa na Queen's English, ihe digodi mkpa ugbua bu ka anyi ghota onweanyi. Ka anyi mara where our experiences di similar, na ebe ha di different; ka anyi choputa godi ebe mmiri'a si wee baa n'opi ugboguru. A'dina inhibited. 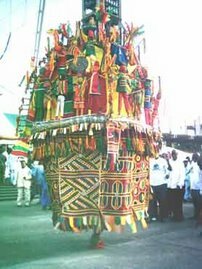 O'ga dikwa worthwhile, ma oburu na otu-onye e were this write-up, degharia ya n'Igbo zuru ezu, etu osiri kwesi. Any takers?